Seventeen year old assassin-in-training, Aveline, is ready to die rather than submit to her fate working in a brothel to repay her late father’s debts. On the night she tries to end her life, a stranger stops her and offers a proposition: a clean slate, in exchange for her agreement to become the guardian of a young woman she has never met. Leery of the assignment and the man behind it, Aveline has no other option but to accept the deal. Aveline’s suspicion that something is off about the arrangement magnifies when she meets her new ward, Tiana Hanover, the daughter of the most powerful man in Lost Vegas. Expecting a pampered princess with an attitude, Aveline is surprised to discover Tiana is little more than a slave – and harboring a secret the wealthy Hanover’s cannot risk being revealed in two months, on Tiana’s eighteenth birthday. Determined to keep the Hanover girl alive, Aveline must learn how to protect Tiana from the other Hanover’s or wind up dead alongside her ward. If the name Lizzy Ford is familiar, you may have read one of her forty-plus YA or adult romance novels. Even in my time as a book reviewer I have seen her many books released, but have not yet had a chance to read her stories, until now. 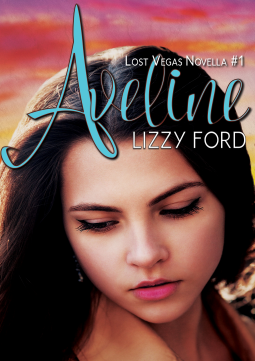 Aveline is the first in a new post-apocalyptic series set in a changed Las Vegas. Aveline has just lost her father and in the emotional aftermath, she must decide whether she will let fate take its course and end up in a brothel, or take on an assignment from a shady character. The assignment puts her directly in the presence of the most powerful family, the Hanovers, who are hiding a treacherous secret. The premise of the story sounds extremely interesting, but I dare say the execution leaves me a little disappointed. The novel is novella length, so this series may be considered more of a mini-series. I believe the shortness of the story contributes to the rushed pace and the inability to sufficiently connect with pertinent characters. It was also hard to settle into this fantasy version of America because there just wasn't enough world building. At the conclusion, I felt relieved that I would not have to labor through a full length novel and not very surprised that there was little to draw me back into the series. I don't mind suspense, but when I finish the book with no answers to any of the questions raised, I'm not inclined to continue the series. The characters, especially Aveline, were underdeveloped and all seemed to be on the same level of basic. They all just sort of played a small part of an unknown story without commanding or engaging the readers to their cause. I think the story would have been fine if focused on one character perspective. Aveline has all the right elements for an exciting story, but it doesn't come together seamlessly.